One down, one to go. Overnight Monday, the first of two eggs hatched in the much-watched bald eagle nest outside Hanover. And that means the second egg could hatch any time now, according to Travis Lau, press secretary of the Pennsylvania Game Commission. "The watch is on," he said. "As always, it's one of those situations where you keep your fingers crossed and hope for the best." The returning pair of massive raptors have for weeks been tending to the nest, located high in a tree on private property adjacent to Codorus State Park. Their every move is scrutinized by rapt live-stream viewers, a number of whom have posted screen shots of the brand-new chick on various eagle-watching Facebook pages. 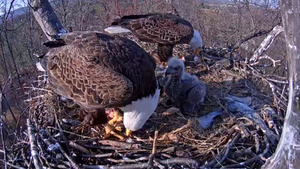 On Monday, those watching the eagle cam reported seeing a "pip" in the first egg, which is a tiny crack or chip. And a night-vision camera feature — new this year to the nest — has now revealed nighttime developments as well. Dramatic storm: Last year, people watched as a spring blizzard left one of the adult eagles literally covered in snow as it sat on the nest protecting its eggs. That episode turned out to be one of the big nail-biters of last season, and both of last year's chicks successfully fledged, creating countless feel-good nature moments. But Lau warned that nature is unpredictable and can be unforgiving, meaning one or both of this year's eaglets might not make it. "We hope that doesn't occur," he said. "But we've said all along that's a possibility." Hanover-area birding expert Karen Lippy said the nest has been active since 2004 and that there have only been three nest failures over the years. She's been watching the nest since 2005 and said she believes the female eagle is 16 years old and the male is 8. Both parents are experienced, in great health and have a strong pair bond, according to Lippy. Some of the perils eagles face including having the nest menaced by owls, being struck by vehicles, eating rodents that have ingested rat poison, eating poisoned meat put out for coyotes and consuming flesh that contains lead shot, according to Lippy. Lead poisoning is a long, agonizing death, she said. Young eagles spotted: Lippy has spotted two 2-year-old eagles and two 1-year-old eagles in the area, for which the mated pair have shown surprising tolerance until last week, when they drove off the upstarts. She said it's possible the young eagles are all the offspring of the mated pair, but said there's no way to know for sure without doing DNA testing. Lau said the live-streaming high-definition camera trained on the nest is allowing both experts and regular folks to witness something once hidden in the treetops. "I don't really know why people have the connection to bald eagles that they don't seem to have for other wildlife," he said. "There are folks who religiously watch the eagle cam and communicate back and forth on (social media). ... You're reaching a group you might otherwise not reach." Recovery: Exposing the public to the secret lives of animals can ultimately serve to protect wildlife, Lau confirmed. "Those types of interactions have led to the recovery of wildlife with countless species," he said. In the 1980s, there were only three bald eagle nests in the entire state of Pennsylvania, he said, and the birds' future still seemed bleak. The populations of eagles and other birds across the country were decimated by the pesticide DDT before it was banned. Without public pressure and committed people dedicated to cleaning up the environment and re-establishing a wild eagle population in the state, "we wouldn't have bald eagles here anymore," Lau said. The rebounding raptor population has been a success story for Pennsylvania, he said. And eagles certainly haven't been the only species of animal nearly or entirely extirpated from the Keystone State. The eastern mountain lion was deliberately wiped out in the Northeast by settlers who viewed the country's largest cat as dangerous to livestock and as competition to hunters, according to the U.S. Fish & Wildlife Service. Deer rebounded, too: In the 1950s, the game commission brought in white-tailed deer from other states because there were no longer sustainable numbers of them here, according to Lau. "That was mostly due to years and years of over-harvest," he said. "It was just kind of the way people lived." Elk is another species carefully tended by the game commission. Elk populations were decimated in Pennsylvania, but through rigorous repopulating programs they have recovered to the point that the game commission now allows an annual elk hunt. The game commission has an elk cam set up in Elk County, Lau said, although it's not nearly as popular as the Hanover-area eagle cam. "I don't think you'll match that level of connection people have with the bald eagle," Lau said, although game commission staff are always being asked what's next. "There's always talk about what's the next animal to be featured on a camera," he said. The background: Nearly 1.5 million individual viewers from around the world tuned in to the eagle cam last year and watched, occasionally with trepidation, as two eggs hatched into defenseless pink chicks that quickly grew into ravenous gray fluff balls. People kept watching as those eaglets grew feathers, became large and boisterous, and eventually fledged. By mid-May 2015, there were 23.8 million live-stream views of the nest. So far this year there have been somewhere around 600,000 unique views. The eagles have nested in the area for about a decade, according to Lau. Fans can post and view screen-grab photos on the game commission's Facebook page and by tweeting #PGCeaglecam.